We like to use our gardens at this time of the year as an entertainment area and as a natural extension to our homes. As we keep hearing on the news, it has been one of the coldest starts to the year for over 30 years, but now that the Summer evenings are hopefully on their way it will be nice to enjoy the warm evening air with family and friends. 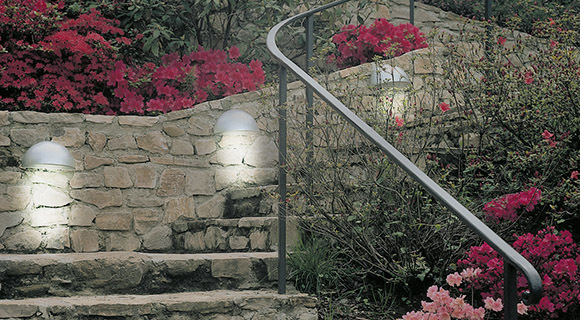 So, dreams of hot Summer nights got us to thinking about outdoor lighting. Have you considered how lights might change the look of the outside of your home and garden at night? Do you have a dark corner or a set of steps that would benefit from a little glowing light? Do you have any features or areas that you want to emphasise? Lighting can accentuate building features, enhance architectural plants, make patterns and add a whole new landscape to your garden and entertainment area in the dark. Adding strings of tastefully positioned twinkling lights can create edges to flower beds, shapes to trees and bushes and add to the overall ambience of your garden. Add too many, and it could look more like Blackpool illuminations, so ‘less is sometimes more’! – Will the lights be powered by the sun or mains electricity? Decide whether you should install solar powered or mains electrically operated lights. Solar lights will cost you nothing to run, but may not be as powerful or give off enough light for the area you are trying to cover. It may also be difficult to run electrical cables around your garden and patio because of its size and ground cover i.e. paving or soil. Balancing the strength of light and variety of light bulb colours can add to the look and feel of the outside area. Adding lighting to an area is a bit like painting a picture in the dark. – Is the lighting to be used as a guide to walking down steps or as an aid for a cooking area? Choose a light bulb that is suitable for the area you are using. With an ever increasing variety of shapes and size of lights from individual lights on posts, ropes, strings or nets of lights, there will be a light for all areas of your garden and home. Think about the overall cost of the lights, their accessibility should you need to change a bulb and where you want them to be located. Would you need to employ a professional to install the lights for you? When moving around outside in the dark, you should compromise your safety. By adding strategically placed garden lights it will help you to move safely through your garden and paths without tripping over pots, garden furniture or falling down steps in the dark. Choosing lights that are fitted with motion sensors and timers can be an added benefit. While they aid movement they also help to keep your home safe and secure at night from unwelcome visitors. A burglar is more likely to be deterred and bypass a house where lights go on and off randomly, rather than trying his luck and bumping into the home owner. Ensure that your lighting does not interferer with your neighbours? There is nothing more annoying than having your neighbour’s spotlights shining into or onto your home. Always be aware of the bulb strength, focal point and area of illumination. For many of us living in a built up area our skies may suffer from light pollution. It can affect your enjoyment of the night sky or negate your need to have outside lighting. Light pollution is caused by millions of lights emitting a glow which reflects off dust and water particles in the sky. Depending on the location of lighting around your seating area, you may find that you have drawn in those nasty mosquitoes and midges. To help reduce their numbers and combat their dive bombing routines on naked flesh, why not try using citronella scented candles to help keep the biters at bay? 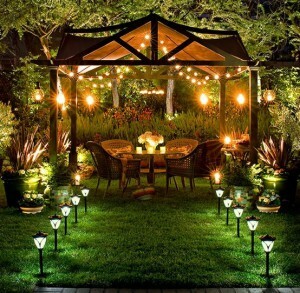 We hope that the above has helped you to select the correct lights for your garden, but whatever your lighting choice and its location we are sure that it will look magical during the Summer evenings. If you would like to find out more about lighting take a look at this website for further guidance. We would love you to send us a picture of your garden retreat lit up by garden lights; why not add it to our ‘garden retreats’ board on Pinterest.